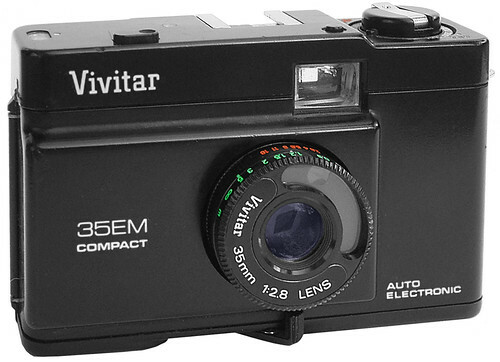 The 35EM was a Vivitar entry in the field of compact, self-capping 35mm cameras, inspired by others such as the Olympus XA and the Minox 35. The lens (a 35 mm f/2,8) retracts into the body, focusing is purely by estimation. Exposure is aperture-priority, with shutter speed indicated in the viewfinder. The light metering is quite unique for its class, with shutter speeds ranging from 1/1000 s to several minutes. Film speeds are set between 25 and 500 ISO. It was also sold in Germany by Foto-Quelle as the Revue 35 Compact Electronic. This page was last edited on 6 March 2015, at 08:54.